The ISIS psyop has been worked on so hard by the architects of the plan that now we are seeing the final desired political goals of the entire operation- an operation which has become more of a global theater. The ISIS psyop theater is now coming to fruition and the globalists are speaking loud and clear about what they want, which is really an admission to why they concocted the ISIS psyop to begin with. They want the authorization to use "unlimited" military "force" wherever they want, whenever they want and (of course) on WHO-ever they want to use it on. Isn't this a tyrannical empire's dream come true? And with this revelation the romance between ISIS and CIA/US/Israel and the other NATO ISIS partners is now fully exposed to anyone willing to see it for what it is. Even when it was revealed that throughout Iraq, "suspicions" were running deep back in September of 2014 that "CIA and Islamic State are united", no one within the mainstream media did anything to stop the ISIS psyop by at least exposing the fact that not one ISIS supply line had been disrupted, not one bank account ceased, not one (illegal) NSA data mining effort able to collect the whereabouts of ISIS (as they do of U.S. innocent citizens) to gather them up and end the ISIS theater. Not one story was reported by mainstream media about the 100+ ISIS supply trucks rumbling through Turkey to get into Syria. Not one story appeared about how Turkey was supporting ISIS or about how the U.S. and it's NATO allies were allowing ISIS to enjoy (food, water, toiletries and ammo) supplies without disruption. Since the launching of the ISIS show instead, mainstream media has been focused on only branding and praising ISIS and showing the world how incredible and unstoppable they are. Since the branding of the ISIS name began late in the summer of 2014 we've watched the ISIS psyop script morph from the fake James Foley beheading video blocked from the masses by YouTube claiming the video was to graphic and offensive, to an organization which is now (supposedly) full-scale global force stronger and more organized than any nation on earth. If you actually tracked mainstream media stories of the last 6 months you will very likely find that ISIS has gotten more headlines than any other single topic. In an Orwellian society that suffers from headline news amnesia, thanks to the "ministry of truth" mainstream media who regularly changes the headline news to fit the agenda of the day, we've seen an unusual repetition of ISIS stories that doesn't even fit the mainstream media's own script, much less the framework of reality, truth and reason. This over-the-top effort by CIA's mainstream media to over-sell the ISIS brand is now primed for being fully exposed with the latest White House bold request for unlimited military power to strike and kill anyone they please. For perspective, let's examine the Obama/White House psyop sequence of responses with respect to ISIS over the last six months. In early September 2014 on the heals of the fake beheading videos and stories of ISIS conquering Mosul and taking over U.S. weapons Obama stated regarding ISIS, "we don't have a strategy", an unusual thing for any leader to say about any supposed threat. The strategy at the time was to make the U.S. FEEL like they were the underdogs. This "underdog" strategy is practiced by boxing coaches and we see this underdog strategy in sports all the time. It is well known that most people enjoy and prefer to root for the (perceived) underdog. Taking full advantage of this human tendency to root for the underdog was a significant piece of the early strategy for recruiting American sentiment and support for "action" against ISIS. Following the September 2014 launching of the- 'We are the underdog' strategy, we heard highly unusual stories like ISIS bragging on social media about their success, ISIS making promotional videos involving the murder of non-supporters, ISIS somehow recruiting members all the way on the other side of the world, even ISIS printing their own money. By the end of 2014 there was almost nothing that ISIS had not accomplished. By the turn of the new year (2015) the ISIS branding was secure and by January the U.S. Government announced the creation of a secret new "Task Force" to deal with ISIS. Details of this task force would be held a secret. The only thing we knew for sure was that it would require a lot of money $$$ to operate, that it would combine the efforts of the other NATO (pro-ISIS) countries, and that it's location would be somewhere in the Middle East or South East Asia, smack in the middle of the region of the world where the U.S. has been illegally meddling in for years in its quest to run the world. By early February 2015 the reaction from Obama and the White House was "Obama Warns Against Exaggerating the Islamic State Threat". This position and this reaction to ISIS was intended as nothing more than reverse psychology. Obama, who had been positioning himself as the underdog all this time, now begins to position himself as someone not so eager to attack ISIS, someone who is calm and not wanting to sound like a warmonger. This was all by design. Just days after announcing his request for unlimited war on the Middle East, all consistent with the PNAC plans, now it is being reported that 4000 U.S. troops are heading to Kuwait to fight ISIS. This is what happens when CIA's mainstream media and its bought out politicians make the decisions that please the U.S. Military Industrial Complex. The rest of us sit here watching these psychopaths lie about ISIS and give themselves power to wage limitless war. As I mentioned in my recent article about the deliberate mainstream media branding of ISIS, most people are not aware of the magnitude of the ISIS brand and how they have been portrayed as greater than god. ISIS is a meaningless group of ($300 a month salaried I'm told) Middle Eastern stray men with both Jesus Christ and Superman-like powers, combined into one. According to western corporate media, ISIS has greater intelligence than all of their enemies combined. They are a super-human force able to outsmart all military intelligence at once, avoid all global surveillance and NSA illegal data-mining at once. All the while fighting multiple countries on multiple fronts, and WINNING! As I've mentioned before, the ISIS brand has stood up to the world (according to CIA's mainstream media) showing off their razorblade sharp technological skills like programmers, hackers and techies with super-slick untraceable and effective social media prowess. Their totally retarded psychopathic view of life is no deterrent to average Americans, Canadians, Australians and citizens (apparently) all over the world including women!! Average people (as I said in a recent article) apparently suddenly decide the want to join ISIS for no reason at all. I suppose these people (if they actually exist) are overwhelmed by the over-the-top branding ISIS has received from mainstream media. Absolute evidence that marketing and branding works. Recently I saw where one major left wing media personnel tweeted doubts about the ISIS theater script. Is this a sign of things to come within Left wing media? As humanity waits for the people within the media to continue to break ranks and seek truth, we can be sure that things will get much worse before they get better. 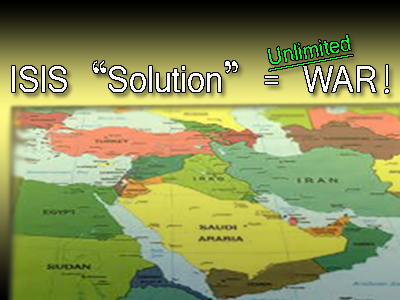 ISIS is a definitive piece of the puzzle for the new world order. It's a powerful tool to enslave humanity by first killing off and destroying the uncooperative sovereign nations that get in the way (like Syria and Iran), then enslaving the rest of us. For now, the ongoing headache known as the ISIS theater or the ISIS psyop will continue unfortunately. The globalist have thrown the kitchen sink at the ISIS psyop hoping to make them greater than life and hopefully this over-the-top effort will be their own undoing. Let's do every we can to expose this pro-war psychological operation whose main goal we are now seeing come to fruition. The globalist gangsters want to wage unlimited war and it's up to us to stop them. We also need to stop thinking of ISIS and the new world order gangsters as being separate entities, they are not. The Islamic state is very much a big part of the new world order plans. Without ISIS, the new world order plans are in serious jeopardy. Try to see this connection and free your mind of the ISIS psyop. Right now it's plain and simple: No ISIS means NO new world order. Obama knows this, the White House knows this, traitor John McCain knows this and many in D.C. know this. Now more than ever it is important to dump the mainstream corporate media and or hope that enough truth comes out of the media to trigger enough doubt in Americans to stop this latest war authorization trick from the White House. Say no to more reckless war, say no to government (legal) propaganda designed to promote war, and say no to endless promotion of staged terror groups to be used as tools for the globalist final goals. At this point in history Americans are burned out with the same script- Problem Reaction Solution. Let's all step back and change the paradigm that allows for this repeated script to play itself out over and over again. We know that the "solutions" offered by government is no solution at all, instead it's an extension of the problem. We are being fooled every time into- Problem-Reaction-More Problem!